A day after the moon struck the Golden Gate Bridge I went for a shot much closer to sunrise. I generally prefer for the sky to be darker. The moon loses a little contrast but the foreground becomes easy to expose in this 1/125 exposure at ISO 500. What was the f/stop? Well I shot it using an 80mm aperture, 600 mm focal length refractor telescope at prime focus. There are no blades or aperture controls in a telescope. The astute, however know that f/stop is the ratio of focal length to effective aperture. That works out to f/7.5 for this configuration. Did you realize that you can buy a 600mm f/7.5 "lens" for under $600 dollars? Of course this lens does not have auto focus, is a bit bulky, and requires a few additional (inexpensive) parts to couple it with a camera. I cover this ground in my Astrophotography 101: Getting Started Without Getting Soaked Webinar. 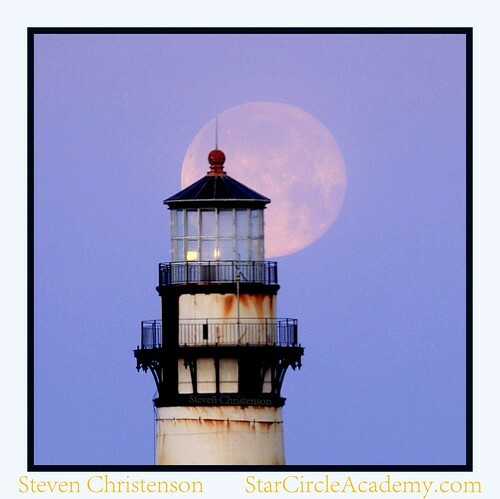 If you just want to learn how to be in the right spot to get the moon, my "Catching the Moon Webinar" may be just what you're looking for. Nearly a hundred people have taken it... and I've gotten nothing but great reviews. PS This is not a "photoshopped in Moon!" it's the real deal.